6) Alarm warning on low voltage, poor reception, etc. 1) Ascertain that the transmitter is in the PPM mode. Turn off the transmitter. 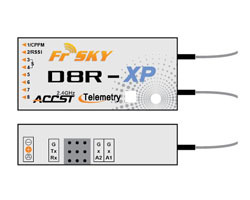 2) Turn on the transmitter while holding the F/S button on the transmitter module (Ensure that both switches on the transmitter module are OFF when using D8R-XP in two way mode). Release the button. The RED LED on the transmitter module will flash, indicating the transmitter is ready to bind to the receiver. 3) Connect battery to the receiver while holding the F/S button on the receiver. The RED LED on the receiver will flash, indicating the binding process is completed. Turn off both the transmitter and the receiver. 4) Turn on the transmitter and connect the battery to the receiver. The GREEN LED on the receiver will indicate the receiver is receiving commands from the transmitter. The receiver/transmitter module binding will not have to be repeated, unless one of the two is replaced. Warning: Battery or servos are NOT to be plugged into side ports (A1/A2/Rx), otherwise damage may occur. A pre-flight range check should be done before each flying session. Reflections from nearby metal fences, concrete buildings or trees can cause loss of signal both during range check and during the flight. 4) Turn on the transmitter and the receiver, press the F/S button of the transmitter module for 4 seconds to enter range check mode, the RED LED of the transmitter module will be off, GREEN LED will flash rapidly, and the beeper will sound. The effective distance will be decreased to 1/30 of full range. Failsafe is a useful feature in which all controls move to a preset position whenever the control signal is lost for a period of time. D8R-XP supports failsafe function for all channels. 3) Press briefly the F/S button on the receiver (less than 1 second). The transmitter module will make a long “beep”, indicating the failsafe position has been set in the receiver. It should be noted that 3.3V only has a limited driving current (1~10mA), it should not be used for driving a MPU. 2.5.1Two external analog telemetry ports (A1&A2) and one digital data-stream port (Rx). 2.5.2When side port pins of A1 and X are connected by the jumper, A1 will change from external analog telemetry port to internal built-in battery voltage sensor. Turn the transmitter off, connect the battery to the receiver, pressing the F/S button of the receiver for 6 seconds and then release. The red LED will flash fast in HS mode and slowly in FS mode. The mode alternates each time this procedure is done. Warning: HS mode is only applied for high-speed digital servos. Other servos should select FS mode, otherwise servos will get hot and may burn out. CPPM channel can not handle all eight channels at the same time with all throws are maxed out, as it does not have enough frame gap. It is recommended to use at most six channels from CPPM channel while leaving off the rest two channels, otherwise improper performance might occur.